This is a Whelk, a snail that consumes dead livestock on the reef. It will also attempt to attack and kill snails. These are carnivores. I had at least six of these in my 55g reef for the frist year, and never had a problem. After carefully acclimating a tiny Golden Maxima clam, the next day I found all the whelks finishing off my beautiful clam. They definitely attacked it - as clams are part of their diet - I only learned later. One of the blights of many SPS keepers has been the notorious red bugs, which aren't even red! These tiny fleas are yellow and tend to congregate on smooth Acropora colonies. They are tough to kill, using a prescription product called Interceptor from your local vet. Please refer to Reef Central as well as this link for instructions on dosing this product, as it is quite an endeavor that has to be repeated three times and which may affect pods and crabs in your tank. While visiting my local fish store, I saw this little nudibranch on the glass. It was very pretty, and I was reasonably sure it would eat whatever it could blend in with: Pink Star Polyps. 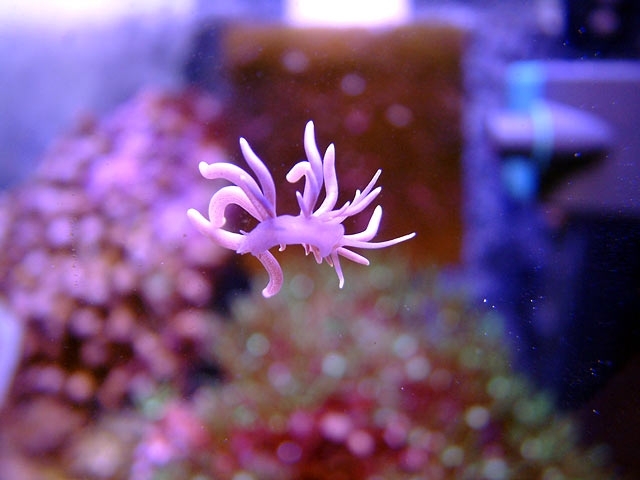 Odds are, it is Phyllodesmium briareum. Here is a link with additional information. Not Reef-safe. The Pycnogonid is a sea spider that apparently preys on SPS corals like Acropora and Pocillopora. These are very hard to spot, and require a keen eye to even notice their presence. Hobbyists wait until lights out and use a flashlight to spot this pest. No known predator at this time, they are removed by dipping the coral in a solution like Bayer, CoralRx, or similar. Photo above by Brandon Templin. If your zoanthids are in trouble, look closely for a creature that like the one above. Amy discovered this on her sick little zoos, after reading this article by Ron Shimek. Upon further discussion in a thread, she learned the best way to remove these from her tank was to put the zoanthids in quarantine. Mike found this colorful creature completely by accident. His suncorals were somewhat closed up, and this polyp was on the move! Using tweezers, he removed this nudibranch. Odds are it is a Phestilla melanobranchia, a cup coral eating nudibranch. In this case, the animal ate suncoral tissue and as it did, its body matched the coloration of the coral fare. As he couldn't afford to buy Tubastrea to keep this little guy fed, it perished. Not Reef-safe. This nudibranch is very likely a creature that feeds on soft corals, such as leathers. Nudibranches in general are pretty to look at, so it comes down to maintaining their food source if you hope to keep it long term. Most reef keepers would prefer to focus on the corals rather than such predators. I'd remove it if I were you. Glass Anemones, or Aiptasia, are a real problem in reef tanks. They spread quietly, and retract quickly when reef keepers attempt to kill them. Using Kalk-paste, they can be injected until they melt away. However, all of the tissue mass must be removed or new aiptasia will return. Removal is best done outside of the tank. Peppermint Shrimp and Copperband Butterflyfish are natural predators, as are Berghia nudibranchs. Do your best to keep these pest anemones out of your tank. These tiny green anemones seemed so innocent. I bought four just for their color, not knowing these were Anemonia Manjanos, which quickly split and made more of themselves and spread. Soon I had 40 of these guys in my tank. They are attracted to light, and will climb the rockwork to get to the top. Their sting is damaging to corals, and eat up 'real estate' other corals could use. This is definitely a pest anemone, and using a syringe with boiling water, I removed every one of them.